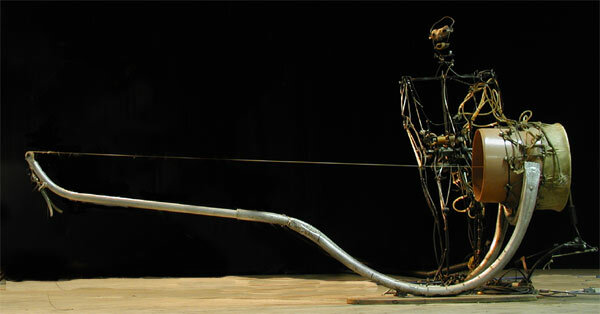 YoYo Berimbau is a robot that was created by Amorphic Robot Works around 1998. Originally, he was sequenced to play along as part of a larger installation. Chico MacMurtrie, the Artistic Director, wanted make some of the robots interactive. I proposed to make YoYo interactive using sound, building upon software I had written to mimic the flow of conversations. Using this as a base, YoYo listens to the rhythms that people make, then plays back his own rendition of that rhythm, trying to start an impromptu jam session with all those who pass. It was programmed entirely in Pd with Miller Puckette's [bonk~] object providing the crucial sound to impulse information. The Pd patch communicates with Yoyo's mechanisms using MIDI to hardware designed and built by Frank Hausman and Eric Singer.